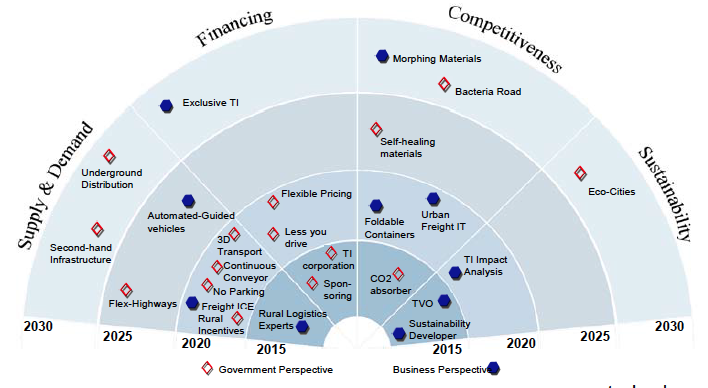 The following foresight brief presents the findings of the innovative real-time Delphi study “Transportation and Logistics 2030 Vol. 2” prepared by PricewaterhouseCoopers’ transportation unit and the Supply Chain Management Institute (SMI) at the EBS Business School, Germany. Overall, 104 experts assessed 16 projected futures in terms of probability of occurrence, impact on the transportation and logistics (T&L) industry, and desirability of occurrence. By deriving conclusions organised around four general themes, possible scenarios for the future of logistics were drawn. The purpose was to identify key developments in the T&L industry by the year 2030. In addition, the effects on the transport infrastructure environment from a governmental and an engineering and construction industry perspective were assessed and opportunities for governments were derived. The development of transport infrastructure requires a long-term planning horizon. Ports, airports, roads and railroads all share a commonality: their life cycle spans are fairly long. Thus, long-term foresight is needed to estimate the demand for transport infrastructure and assess its impact on the economy and the environment. Long-term thinking is a requirement to finance construction, operation and maintenance of infrastructure. Scenario techniques are an essential addition to traditional forecasting methods. Trusting solely on trend extrapolations and single-point forecasts does not account for the paradoxes in transport. For example, who could have predicted that the amount of transports would decrease between 1995 and 2005 in a Western European country while politicians were talking about investing in infrastructure to meet the increase in freight transportation? What actually increased is the transport service provided for goods. Less goods were transported but over longer distances and/or in smaller batches. Governments and everyone in T&L industry faced the need to respond, and lucky were those with a contingency plan on hand. In pursuit of such a long-term perspective, the study aims to develop a comprehensive view of the T&L industry in 2030. The outlook is developed by interpreting scenario evaluations, identifying opportunities, applying a cross-industry perspective and deriving extreme scenarios. The next sections will focus on the results of the first two issues (i.e. scenarios and opportunities). The study employs an innovative version of the Delphi survey method. The Delphi is designed as an Internet-based, almost real-time survey that increases the validity of results by streamlining the classical procedure (see Gnatzy et al., 2011; Gordon & Pease, 2006). Overall, 16 key future projections were organised around the four general themes “Supply & Demand”, “Finance”, “Competitiveness” and “Sustainability” of transport infrastructure. The projections were assessed by 104 invited experts in terms of probability of occurrence (0-100%), impact on T&L if they occurred (5-point Likert scale) and desirability (5-point Likert scale). Furthermore, experts could optionally provide qualitative arguments and reasons for their answers. Once an expert evaluated a projection, the statistical group opinion of all experts was calculated and visualised immediately. The group opinion was presented in a box-and-whisker plot. In addition, the qualitative arguments given by the other experts were also shown. In the light of this new information, the experts were able to revise their initial assessment. Upon completing the survey, a consensus portal was activated showing an overview of all answers given and how the answers related to average group opinion at that point in time. During the survey period, experts were able to access the consensus portal at any given time in order to check whether they were in line with group opinion or deviated from it. The experts could also adjust their assessments at any time if they wished to do so. Participants were based in 29 countries around the world ensuring a balanced and global view: the emerging countries accounted for a significant share of 38% and the developed countries for the remaining 62%. Figure 1 summarizes the results for the area “Supply & Demand”. The resulting demand for transport infrastructure is unlikely to be met by 2030. Although emerging countries are investing heavily in transport infrastructure, it is unlikely that the infrastructure provision gap to developed countries will be closed completely within this period. Megacities are likely to attract more projects since investors “follow the money”. Road tolls and congestion charges are likely to have become an instrument to match supply and demand of transport infrastructure in 2030. The second major theme relates to financing transport infrastructure. The results are shown in Figure 2. Governments, although aware of the need for major investments in transport infrastructure, are likely to face strong financial constraints over the next 20 years. For many governments, the task of maintaining the current infrastructure will leave little scope for funding investments in new transportation infrastructure. While governments are likely to remain responsible for local and national transportation infrastructure, private investors seek economies from focusing on national and international large scale transportation systems. The evaluated scenarios for “Competitiveness” in T&L in 2030 are shown in Figure 3. Getting transport infrastructure right remains a competitive advantage as efficient supply chains are a major investment factor. To enhance a competitive advantage, fully integrated infrastructure systems with modern information and communication technology (ICT) present a major enabler for cutting-edge transport developments. Thus, transport infrastructure development can strongly benefit from advancements in digital infrastructure. Moreover, forming clusters based on close collaboration of industry, academia and government will benefit regions by activating new potentials in transportation infrastructure development. Ensuring the sustainability of transportation infrastructure is probably the most significant challenge to be faced over the next 20 years. The opinion of the experts is shown in Figure 4. Clearly, transport infrastructure and its networks have a strong effect on the environment. In addition to its ability to stimulate economic growth, transport infrastructure will increasingly be assessed in terms of its environmental compatibility. Increased regulations in the form of emission trading systems or other systems are likely to enhance this compatibility. Environmental costs of transport infrastructure will become an integral part of assessing the full costs of a T&L project. These costs will need to be calculated into the business case of any of these projects. Flexible planning will be key to logistics service providers, supply chain players, transport infrastructure operators, users and owners since transport infrastructure systems will remain imperfect. Especially in emerging countries, innovative supply methods based on local adaptability and simplicity have to compensate the lack of transport infrastructure. Governments need to target the implications of the trends in “Supply & Demand” as well. 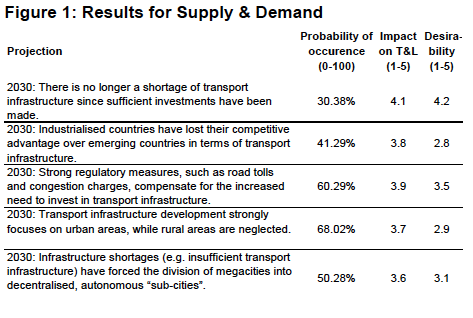 As shown in Figure 5, access to rural transport infrastructure is not a matter of course. 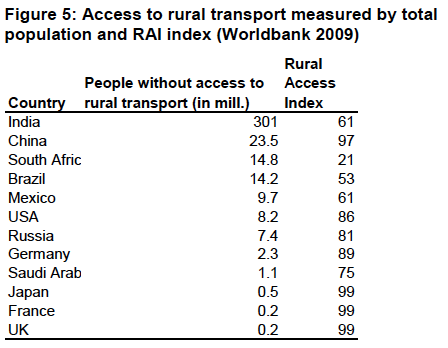 The RAI index estimates the proportion of the rural population that has adequate access to transport systems. Governments need to offer investment incentives to ensure that less investment-attractive rural areas will stay connected to regional conurbations. Governments play an important role in managing supply and demand for transport infrastructure. The surveyed experts believe that road tolls and congestion charges could be a powerful lever to reduce traffic and raise capital to invest in more sustainable modes of transportation. The financial boundaries clearly impact T&L. Logistics service providers need to assess the availability of capital and the willingness of a government to invest in transport infrastructure when entering a new market. Governments need to find a balance between investments in new transport infrastructure and ongoing maintenance of existing facilities. It will be essential to incorporate future maintenance needs in all new projects as well. In addition, a shift in focus from upfront costs towards lifetime costs is needed to ensure whole life funding. Rather than a one-size-fits-all approach to finance these activities, public authorities need to find strategies to share risk and responsibility with private investors for individual projects. In order to stay competitive, logistics service providers should join clusters to actively collaborate with governments, academia and operators of transport infrastructure. Knowledge exchange and management across company borders will be a key success factor over the next 20 years. In 2030, it is even more essential for governments to maintain, upgrade and expand transport infrastructure in order to ensure and attract foreign direct investments. To achieve this, information and communication technology must be incorporated as the path to be taken towards developing a cutting-edge transportation infrastructure. In order to ensure eco-friendliness of transport infrastructure by 2030, independent bodies could be established that rate transport solutions in terms of their environmental compatibility. In addition, efforts should be made to reduce demand and optimise capacity. Innovation will be critical in finding these new eco-friendly transport solutions for T&L. More than ever, companies in T&L will need to collaborate to better manage transport emissions in order to cope with the expansion of emission trading systems. Transport infrastructure developers should be aware of the long-term environmental costs. They will need to assess the entire life cycle of construction, operation and deconstruction to consider harmful environmental effects as well as environmental benefits. To close this overview of the Delphi study, we will focus on some promising future opportunities related to transport infrastructure from a governmental perspective over the next 20 years. Figure 6 summarizes these for the four areas identified. The radar depicts the (generic) outcome of several future workshops based on the described scenarios. In Supply & Demand, governments may actively counter the trend of a “rural exodus” by setting up basic transport infrastructure, offering public-private partnerships and implementing other financing mechanisms. In order to reduce congestion in city centres and its side effects, governments may abolish parking spaces at public institutions while ensuring good connections to public transport. Governments might use innovative infrastructure constructions such as sky walks and sky trains or underground distribution systems to lessen the burden on existing transportation infrastructure on the ground. A full automatic continuous conveyor could reduce transport bottlenecks at ports and other hubs by moving containers away from the point of handling to their desired destination quickly. For governments to deal with changing demand, re-usable transport infrastructure comparable to unit assembly systems could be developed. Governments need to think of ways of how to finance the increasing demand for transport infrastructure. One idea relates to private sponsoring. For example, sponsoring stadiums, such as “Signal Iduna Park” or “Gilette Stadium”, could involve financing parts of the necessary transport infrastructure. Tax benefits and other incentives could be used to encourage companies to drive less while individual charges for the use of small parts of infrastructure (e.g., bridges) represent opportunities for reducing demand. Future CO2 absorbing materials could be used in new road constructions and could possibly make a big contribution to environmental protection. Self-healing roads through the use of bio-concrete or nanotechnology could reduce maintenance costs. In the same vein, the idea of bacteria-produced roads might be an innovative way for governments to build transport infrastructure in rural areas in the very long-term. Lastly, governments could use the idea of self-sufficient eco-cities to address the need for a sustainable future infrastructure. Gnatzy, T., Warth, J. & von der Gracht, H. A. (2011): Validating an Innovative Real-Time Delphi Approach -– A methodological comparison between real-time and conventional Delphi studies. In: Technological Forecasting & Social Change, corrected proof, in press. Gordon, T. & Pease, A. (2006): RT Delphi: an efﬁcient, “round-less” almost real time Delphi method. In: Technological Forecasting & Social Change 73, (2006) 321–333.